I just wanted to make this quick post about something I saw Saturday. I was at Costco waiting in line for the gas pumps. Saturday is always super busy there, so I was probably 3-4 vehicles back from the pumps. As I'm sitting in my truck, I see another truck pull up beside me. As he pulled up (truck in motion- pulling in from the road), I saw 2 children hanging out of the car windows. They were laughing, both unbuckled- no car seats. They were both neatly dressed and clean, and seemed really happy, but the fact that they had no car seats and were unbuckled sent off alarm bells in my head. I wanted to call the police, and even wrote down their license plate number just in case, but I decided not to call, as they would be long gone before anyone got here. I waited until we were both on opposite sides of the pump and I was going to say something. When the man got out, you could tell that he was their grandfather, and they were probably having a fun day together. The boys looked around 3 and 8 years old. I couldn't help but stare as the kids played with the open window- the youngest one standing up on the seat. My truck sat up slightly higher than his and I could see that there was no car seats in the car at all- no boosters or anything, even though the 3 year old shouldn't be in a booster I thought they might at least have that- nothing. I didn't say anything and I didn't call the police. He saw me staring and rolled up the car window but the kids were still unbuckled when he pulled away. From experience I know that most people don't respond nicely to hearing they're doing something wrong. This example is why it's so so important to teach your parents and grandparents (and anyone that may have your children) about car seat safety. I imagine the older man probably didn't know anything at all about car seat safety other than the fact that the kids should sit in the back seat. About 10 minutes later I pulled into the parking lot of the dollarstore. Once I was done at the store I came out and there was an SUV parked beside me with the door open. An older couple had the back seat door open and were both putting their granddaughter into her rear facing car seat. She apologized for having the door open (blocking my door) and said she was strapping her wriggly toddler granddaughter in. The grandfather asked the little girl if she was okay and comfy, and laughed when she ignored him. She was safe, rear facing and content. 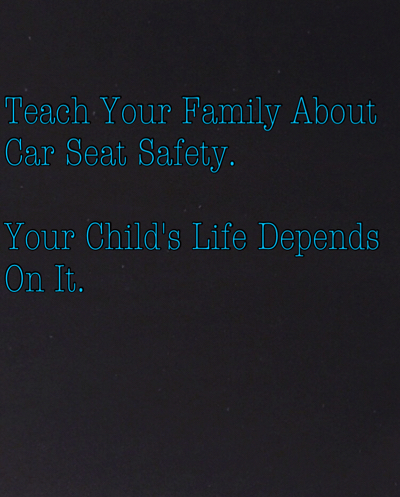 These are both completely opposite examples of why teaching our family about car seat safety is so important. If you don't say anything, you may have something happen like the first example, where he just put the kids in the car and went. Or you could have well educated, responsible grandparents who take the time to properly strap the child in according to what you taught them. Times have changed and we know so much more about car seat safety than we used to. It's up to us to pass the information on in order to keep our kids safe.